So I ambushed Rod at a local Whataburger restaurant- that was literally a few miles from me. Being that it was in the boondocks and they just weren’t expecting anybody to show up, having me walk through the door must have humored him and his sound guy greatly as I they are beginning to recognize me when I show up for their events. I printed out a photo I found online of Rod for him to sign. 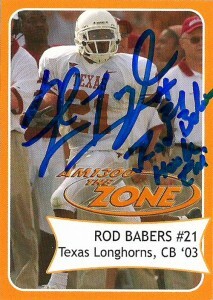 Whataburger also provided him with a card as well (which was nothing compared to my Upper Deck UT doppelganger). I sat around and ate dinner while I talked to Rod and Chuck about sports. It was nice to see the inner workings of how radio works. Rod again was quite flattered by the memorabilia, and also told people on the radio that I was a true fan because I had a James Brown jersey on from not UT- but the Texas Terminators indoor football team. I am honesty running out of photos of Rod and am hoping to get my paws on one of him in his Tiger-Cats uniform. Later I got this photo of Rod making the play against Raushaun Woods keeping him from scoring the 2 point conversion and allowing the Longhorns to win the game when he was at the Texans Draft Party that had Danieal Manning and James Casey at it. Rod’s a very personable fan of fans. I think that’s great, and exactly what 1300 the Zone’s lineup needs. Guys who’ve played who like talking about football, while educating and embracing fans. I’m not so sure of some of the latest additions to the station’s lineup, as I think Rod pushes the boundaries of taste sometimes as it is. Rod is also known by a few names to fans: Kool Aid, and Stonehands, are two of my favorites, but on the radio he frequently is known as Black Caesar. He’s said some things on the radio that have surprised me, from convincing me that as Longhorn fans we should wish anybody- even A&M the best in the SEC, to the idea that Longhorn fans should not be happy with ‘just playing well in a loss’. Currently he’s the host of UT’s Afternoon Buffet on 1300 the Zone. 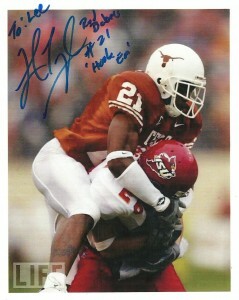 He also spends his time giving back to the community working with the Neighborhood Longhorn Foundation.